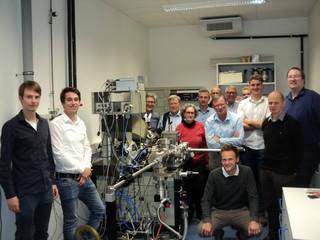 For the first time, our XPS team organized the annual international XPS user workshop in Cologne with participants from University of Groningen (NL), Ghent University (BE), TU Darmstadt (Germany), Fraunhofer ISC Würzburg (D), Forschungszentrum Jülich (D), NMI Reutlingen (Germany), Freudenberg Technology Innovation SE & Co. KG (D), Euroscan Instruments SA (BE), and our research group.The event started with a sightseeing tour in the city center of Cologne followed by a dinner at a traditional Kölsch brewerie restaurant kindly supported by our XPS service partner Euroscan Instruments SA. The meeting continued with a broad variety of lectures. Participants present their research institutions, special features of their instruments, interesting research results and practical problems. After lunch, the results of this year's Round Robin sample, a stainless steel disc were displayed and compared. Finally the event was ended up by a lab tour.